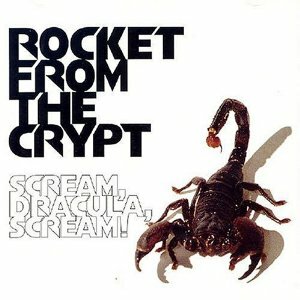 Rocket From The Crypt – Scream, Dracula, Scream! | NoCoda. What It Sounds Like: Speedy (but not too fast! ), loud, and catchy rock ‘n’ roll fused with punk and ska (bring on the horns!) that know when to dial it in and dial it back. I’m a huge John Reis fan, and if he’s involved in something, I’m gonna seek it out. Sultans, Obits, The Night Marchers, Drive Like Jehu – those reviews have not been written as of yet (or maybe they have, depending on the date that you’re reading this), but at this point in March, I’m still looking forward to them. RFTC was his largest project, being the primary singer and songwriter, and it shows that he and the boys were capable of breaking free of the mid-90s alternative bonds and giving us some rock with a little something extra. The punk element. The ska element. Few other bands have a sound that is this distinctive, yet instantly recognizable and easy to listen to. The trumpet and the saxophone are certainly the claims to fame – they’re present on pretty much all of these songs, and they’re not simply built into the background – you can hear every note, and they’re wonderful! Ball Lightning is a prime example. That chorus has some simple power chords over it, while the horns blare in the background, and even some straight-up-pop “do do do / wo wo wos” that overlap the whole thing and cover it in a rocking sugary sweet syrup. Born In ’69 throws us some forward-facing rock ‘n’ roll that is energy personified. It begs to be turned up to eleven. Fat Lip is simply rambunctious and was probably a sure-fire live favorite. Heater Hands and Young Livers show that, as previously stated, these guys know when to dial it back into easy to swallow tunes that are distinctive, but have their pop influences at the forefront. This whole thing would be in vain without mentioning the most popular single of their career, On A Rope, which has every right to be the highest charting as well. I’ve heard this song so many times, and that opening riff when the horns come in and keep the same time with the guitar – I can just see a packed house going wild. The verse is catchy and instantly recognizable, and the chorus splits the time in half but keeps the energy at the forefront. Listen to this song. I think I’ll be hard pressed to find someone who doesn’t like it. Overall, Scream Dracula Scream! is Rocket From The Crypt’s first major label release, and it’s certainly a contender for one of their best records. At the end of the day, it’s probably my favorite, while 1998’s RFTC comes in a very close second. I have fond memories of seeing Rocket From The Crypt live – in particular, when they banged out Middle, Born in ’69, On a Rope straight in a row to start a show! What I wouldn’t give to see that – I bet it was mind blowing! Yeah, they definitely put on a rocking good show the first couple of times I saw them live. They are a bit older now so they don’t have quite as much energy!